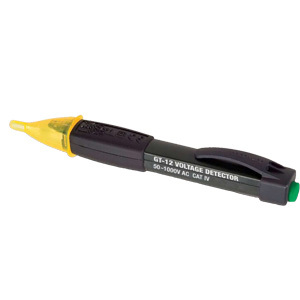 Greenlee is proud to introduce the GT-12 Non-Contact, Self-Testing Voltage Detector! With a sleek new look and fully assembled in the United States, the new GT-12 is a step-up in the crowded landscape of non-contact voltage detectors. The GT-12's most notable characteristic is a continual self-test feature that assesses the complete functionality of the unit. More than just confirmation of the battery capacity, the visual self-test (patent pending) verifies the integrity of the battery, the antenna, and the complete circuitry of the product; the only one of its kind in the marketplace! The GT-12 also includes a silent mode option for quiet environments and an auto-stuff off feature to conserve battery life. Understanding the demands of working near electrical circuits, Greenlee's engineers have designed a unit that makes the task faster, safer, and easier whether in the home or at the job site. As part of the Greenlee Electrical Test and Measurement Product line, the GT-12 meets the latest industry safety standards and is backed by a lifetime limited warranty.